What is children's new first screen? Youth entertainment is changing fast, says IHS Technology. Find out why! The business of kids’ TV is evolving rapidly, the latest edition of IHS Technology’s report points out. The key factors in this ever-changing landscape are of course funding – which still comes from both broadcasters and public sources -, licensing, relationships between producers and broadcasters, and digital TV. This last point is particularly crucial in 2015, as the “second screen” becomes one of the most important – if not the very first – point of access to content children encounter in their lives. Can we still talk about “linear TV” when online and on-demand children content has clearly become mainstream? 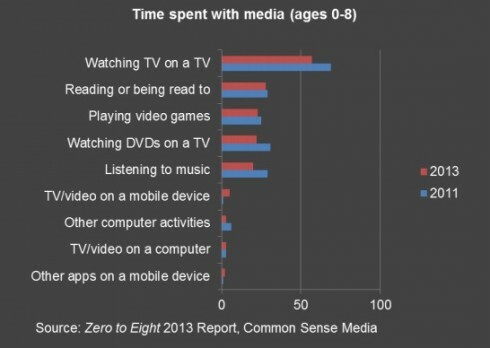 In the US, children aged 0-8 spent 12 minutes less watching TV in 2013 than in 2011, says Common Sense Media in the report. And they can be definitely considered as early adopters when it comes to new screens: in the UK, 42% of children used tablet computers in 2013 – they were just 5% in 2011. However, things may not be over for “traditional” TV just yet. As the data above show, the first screen is still – and by far – the number one source of content for children, even if the time spent watching it is decreasing. Only mobile devices show a positive evolution between 2011 and 2013. As content is now being made widely available on “non-traditional” platforms, will producers and broadcasters adapt to this new multiplatform world?